Xiantao Dexing Plastic Products Co., Ltd.
Xiantao Dexing Plastic Products Co., Ltd. was located in Pengchang Town, Xiantao City, Hubei Province. As everybody knows, Pengchang Town is the First Town of Chinese Adhesive-Bonded Cloth. The transportation is convenient and the geographical position is superior. Our company was founded in 2003 and is specialized in the production of each kind of SMS compound adhesive-bonded cloth, MB melt sprayed cloth and gas passing blanket compound adhesive-bonded cloth. Our products are widely used in health care, daily necessities, industry and agriculture production and other fields. Our company is also the most great compound adhesive-bonded cloth production base in South China. 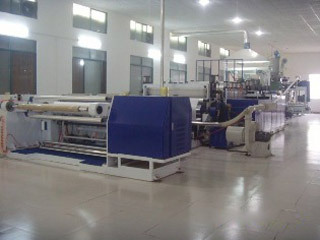 Our company has many advanced and specialized production equipment and instruments. SMS and MB melt spray cloth has characters of good filterability, permeability, waterproof, anti-poison and antibacterial effect. Our product is soft and the uniformity is good. Our gas passing blanket compound adhesive-bonded cloth is mainly used in manufacturing exposure suit, surgery clothes, bed sheet and other products. The soft feel, ventilation and anti-seepage can isolate the blood plasma and other bacteria effectively. In addition, our products have characteristics of anti-static electricity, stimulation and environmental protection as well as anti-poison, anticorrosion. Hongkong Dongsin Digital Co., Ltd.
Dxtel Technologies (China) Co., Ltd.
Zhejiang Wenling Dingxin Brass Co.,Ltd. Xi'an Ding Xing Automation Engineering Co., Ltd.
Pinghu Dexin New Energy Technology Co., Ltd.
Jinan Danxingxian Commerce and Trade Co., Ltd.
Foshan Dexingye Metal Technology Co., Ltd.
Dingxiang County Yi Xin Flange Co., Ltd.
Sichuan DXYK Technology Co., Ltd.